A savory stew cooks in an aluminum Dutch oven . A Dutch oven is a round, deep stew pot which was the principal cooking vessel in Colonial times, and for settlers of the American West. These pots were originally made of heavy cast iron, but started being manufactured in aluminum in the 20th century. Interest in Dutch oven cooking has increased recently, perhaps due to the "green" movement, which focuses on self-reliance. Schools have surfaced to teach how to make complete meals in Dutch ovens. 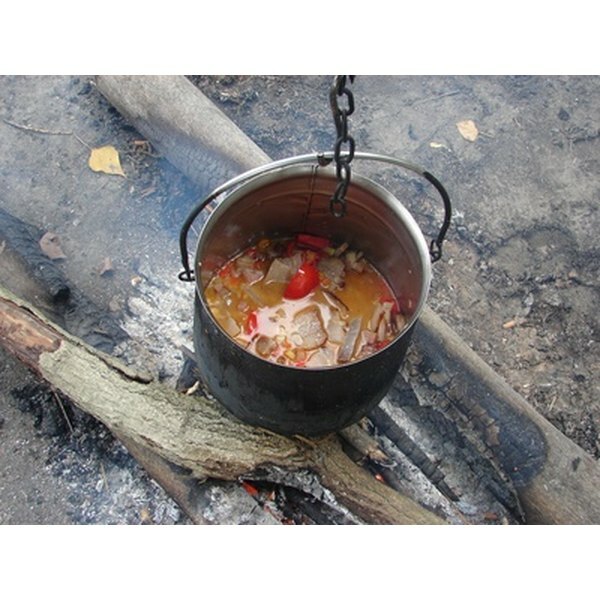 Dutch oven cooking classes teach how to cook without electricity or a standard oven range by using small amounts of hot coals or by suspending the pot over a campfire. Classes are always held outdoors and taught by experienced camping and outdoor cooking enthusiasts. The classes may also be taught at universities that have an affiliated outdoor center. The International Dutch Oven Society, an organization dedicated to preserving the art of black pot cooking, lists its chapters by state so you can find a nearby class. Experienced travelers and Dutch oven enthusiasts Julie and Greg Miklaszewicz offer a curriculum at their Wisconsin RV Outpost, which includes proper cleaning and seasoning techniques and using pie irons/presses over a campfire. If you can't go to Wisconsin for classes, you can check their website, which has details about class topics, videos and informative links. This back-country wilderness adventure specialist, near Santa Fe, New Mexico, offers a variety of Dutch oven cooking classes, from one-day seminars that cover fire and coal preparation and bread baking to a family camping class that also teaches tent camping and wilderness survival skills such as map reading and orienteering. Enjoy storytelling and camp games and songs in the evening. All supplies and camping gear are provided. This program, an extension of Idaho State University via its Outdoor Center, offers two programs for learning to cook using a Dutch oven. The PEAC 182A class teaches basic food preparation and meal planning. Guest chefs provide nightly demonstrations, and students select recipes, buy food and prepare their own meals. PEAC 182C is Advanced Dutch Oven Cooking, and expands upon the previous course. Large-group meal planning, catering and competitive cooking round out the program.